since prior commitments (and a full fermentation fridge) prevented me from participating in the AHA’s learn to homebrew day last saturday, in the spirit of general education I decided to throw together an explanatory beginner’s overview on how to make a basque-style cider, using some readily available ingredients and tools. 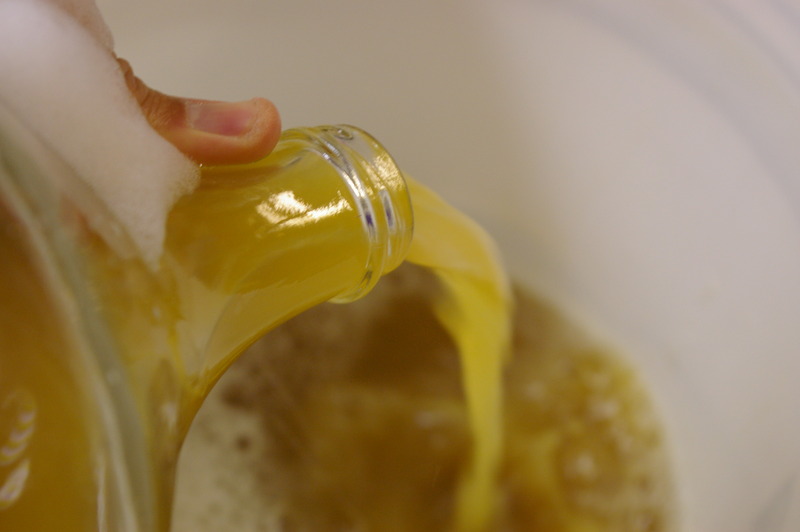 first, you want to clean and sanitize a fermentation bucket, bucket lid (with an airlock hole in it), and airlock. I used a white HDPE 2 five-gallon ace hardware bucket, but any similar bucket will do. I cleaned my bucket with five star’s PBW and sanitized it with star-san, but any food-grade cleaner and sanitizer will work (consult your local homebrew shop). next, I added four gallons of pasteurized organic cider to the sanitized bucket. I picked up the cider at whole foods on sale for about $6 a gallon, but there are other cheaper alternatives out there (just remember that the quality of your finished product is dependent on the quality of your starting ingredients). 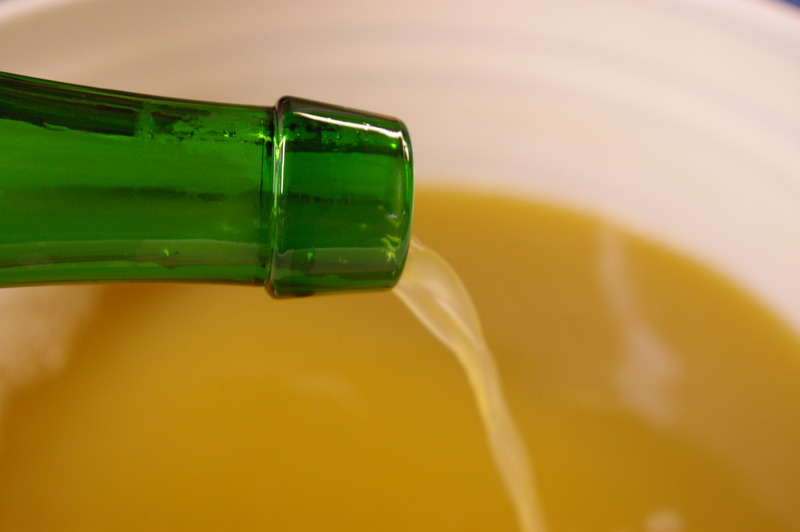 from what I have seen, traditional basque cider is made using only apples, but if you are feeling adventurous, feel free to add different varieties of sugar, fruit, etc. to the juice. 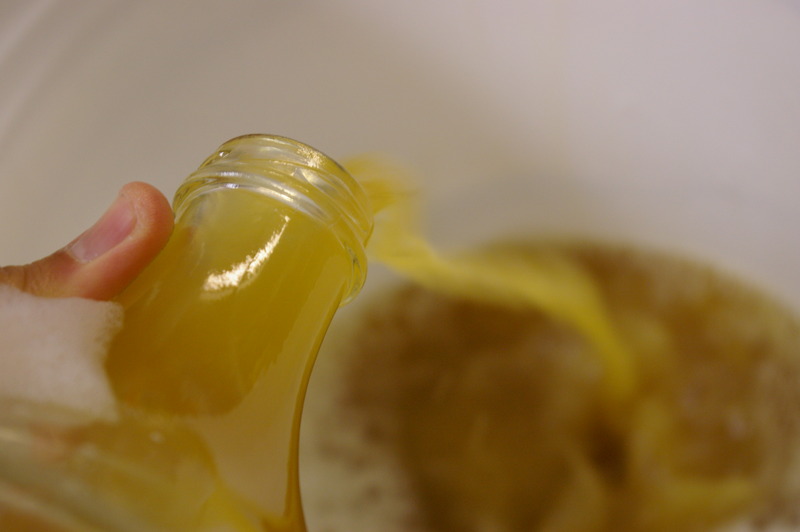 also, if you have unpasteurized locally pressed juice available, you owe it to yourself to use that (in fact, you can add just unpasteurized juice to a sanitized bucket and let it ferment out itself by way of the wild yeast present on the apple skins). after adding the juice to the bucket, I pitched the yeast. I used an old slurry of white labs WLP570 belgian golden ale yeast after reading about the use of belgian yeasts in cider, but any wine or beer yeast will do (cider-specific yeasts are available as well) – again, consult your local homebrew store or look around online. 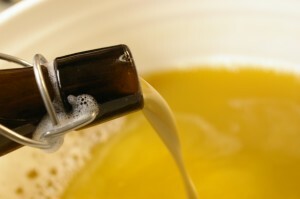 note that most yeasts will ferment the juice to dryness (i.e., there will be no residual sugars/sweetness in the cider). 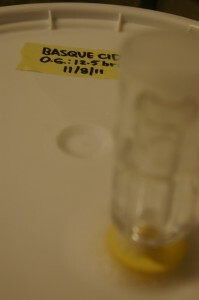 in addition, I pitched some bottle dregs from a bottle of basque cider (specifically, isastegi). the bottle I had purchased earlier this year had mellowed in the bottle, and the cider was light and complex, with a smoother sourness and complementary funk. look online for where to procure bottles in your area (I have seen them in quality craft beer stores as far east as MN, so they shouldn’t be too hard to find). 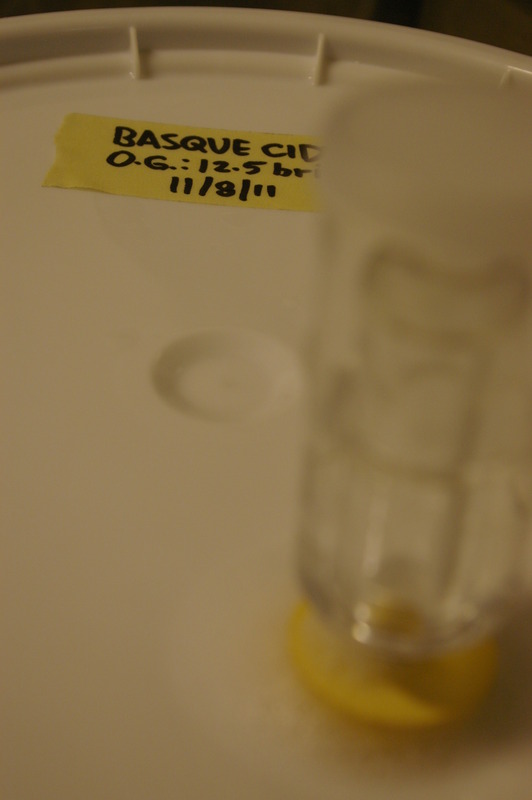 try the basque cider before pitching the dregs, and if you don’t care for it, just leave the dregs out and you’ll just end up with regular cider. after pitching the yeast and dregs, just cap the bucket and install the airlock (I fill mine with cheap vodka, but you can use leftover sanitizer). due to the wild/funky nature of the fermentation, I would wait at least three months before bottling/kegging to let the bugs work their magic (I’ll probably transfer the cider to a keg after a month or so and sit on it for an additional five months before bottling). 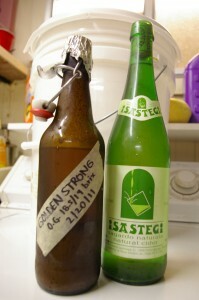 if you chose not to add the basque dregs, you can likely bottle the cider after a few weeks. also, if you use the basque bottle dregs, note that everything fermented in your bucket from then on will likely take on a funky note, so use separate containers for funky and non-funky fermentations. despite my wordy explanation above, the process itself is very simple, and might be the most straightforward (and inexpensive) fermentation project one can take on. good luck! This entry was posted on Wednesday, November 9th, 2011 at 2:56 pm and is filed under brewing, events, ideas. You can follow any responses to this entry through the RSS 2.0 feed. You can leave a response, or trackback from your own site. I did the above steps, used champagne yeast and ended up with something that is way too sour for my palet. Any suggestions? VG, one option is to stabilize your cider to halt fermentation (either by adding potassium sorbate or by cold crashing) and then add sugar, honey, juice, etc. to backsweeten the cider to balance out the tartness. you can also halt primary fermentation before it is finished in a similar way. another option is to use a different yeast strain. all yeast strains will likely ferment out the juice to dryness, but each strain adds particular characteristics to the finished product. I used champagne yeast for a long time for both my ciders and meads, but am shying away from it these days since it’s characteristic “champagne-y” finish is a significant factor in my finished product. beer yeast supposedly leaves you with more apple character in the finished product vs. a more wine-like result (and may be less sour to your palate). i would experiment on small batches (using a method like this: http://www.overcarbed.com/?p=1294) to see what yeast combination you like the best, then step it up to a full batch.